If you’re only planning to take a day tour from Belfast, or worse – from Dublin, you should really think again. The Causeway Coast is a seriously beautiful part of the world that warrants far more than a stopover for a few quick photo ops while on a bus tour. 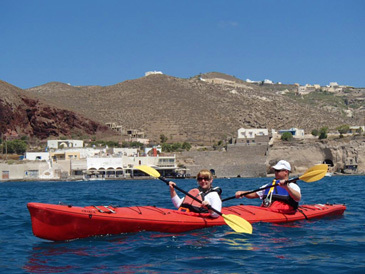 Nature and outdoor lovers will especially want to plan time to venture along the coastal path hiking routes that snake along a coastline that seemingly changes its landscape around every bend. Would it really be a trip to Northern Ireland without some Old Bushmills? And even if you’re not a Game of Thrones fan, sights like The Dark Hedges that were made immensely popular by the tv series are well-worth the stop. 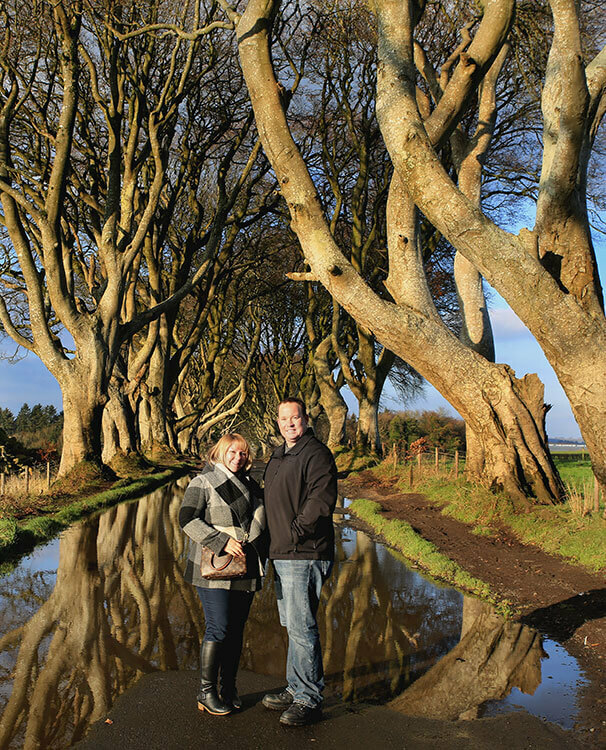 Spend the first day of your Causeway Coastal Route itinerary discovering some of the inland beauty as you make the drive from Belfast to the Northern Ireland coast and getting to know the world-famous Irish whiskey with a tasting. Since we arrived in Northern Ireland’s capital in Belfast, The Dark Hedges are right on the way from Belfast to Giant’s Causeway. 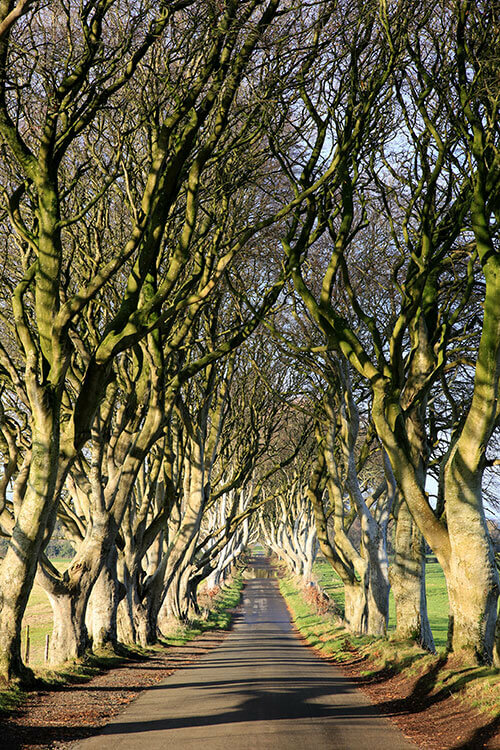 Extremely popular, especially in large part as a Game of Thrones set location, The Dark Hedges are one the most photographed spots in Northern Ireland. Even though we’ve never watched a single episode of Game of Thrones, we couldn’t miss out on seeing this natural phenomena. The Dark Hedges were originally planted by the Stuart family around 1755 in order to impress arriving visitors on the approach to their Georgian mansion. They planted 150 beech trees along the drive to Gracehill House. We’d bet they could never have imagined that the beech trees would grow into such a twisting, entangled mass where shadow and light play under the canopy. Or that the scene would not only inspire artists and photographers, but also Hollywood. Officially the section of beech trees along the road that comprise The Dark Hedges are just over a half mile in length. Today the beech trees are well past maturity and it’s not uncommon for the branches to break off regularly. Time, weather, nature and even tourism has taken its toll on the trees and fewer than two thirds of the beech trees remain today. Two of the trees collapsed in 2016 during Storm Gertrude and many of the trees were damaged when 60 mile per hour winds from Storm Hector swept through in summer 2018. In order to help with conservation efforts, the road on which The Dark Hedges reside has been closed off to traffic since 2017. Arriving on a late autumn day, we actually weren’t entirely convinced we were in the right place at first. There’s a sign that the road is closed to traffic, and if you arrive from the south end as we did, you can’t see The Dark Hedges until after a couple minutes of walking along Bregagh Road. Official parking for the site is located on the opposite end of the road next to The Hedges Hotel. Even in late autumn, the Game of Thrones tour buses stopped and unloaded fairly regularly. So if you want people-free photos of The Dark Hedges, you either need to arrive very early before the bus tours or you need to spend some time there simply waiting out the groups. It’s worth the wait, though, especially when the buzz of the crowds is gone. It’s an incredibly peaceful spot to enjoy when there’s nothing more than the sound of the birds chirping and the occasional rustle of the wood mouse scurrying about. 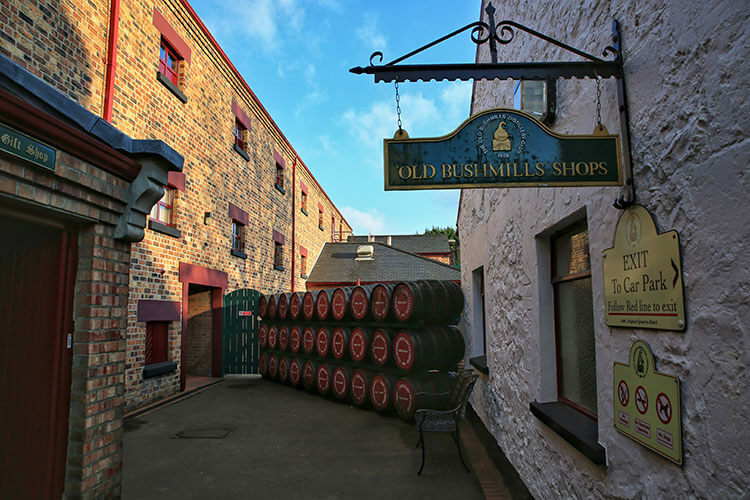 The Old Bushmills Distillery, located in the village by the same name, is considered the world’s oldest licensed whiskey distillery. 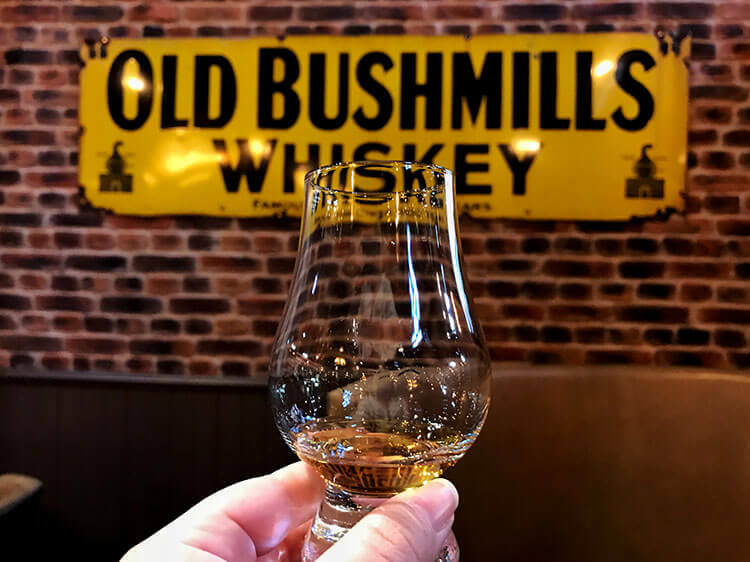 Though we read that the tour itself can be hit or miss depending on the guide you get, we certainly couldn’t pass up a chance to take the Bushmills distillery tour and see the home of Irish malt whiskey. Unfortunately for us, we got one of the pointedly factual guides. He was all business with sticking to a script about the history and the whiskey making process on the Bushmills tour. They oddly also don’t allow any photos either inside or outside during the tour, which they say is because of lingering vapors. That said, Bushmills is a working distillery with all of the whiskey made onsite. Bushmills produces nearly five million liters of whiskey per year with stills running seven days per week. 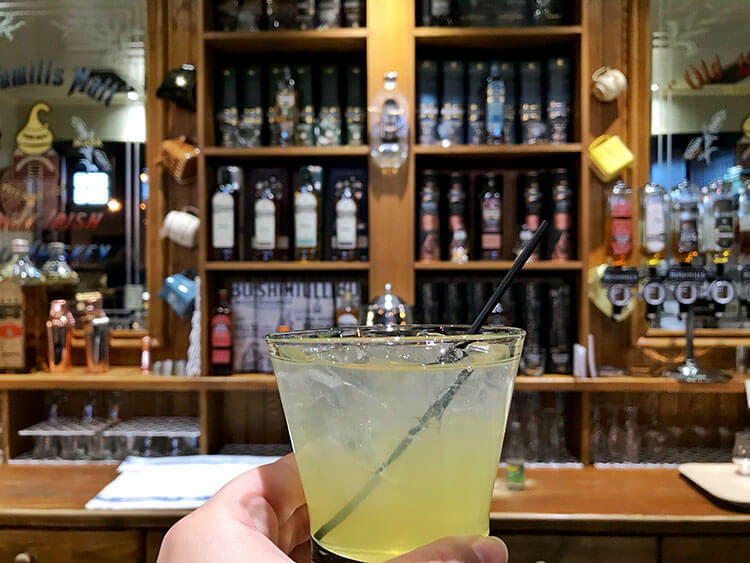 On any given day that you visit, you’ll witness distilling in action. Bushmills received their license to distill in 1608 from King James I and they’ve got centuries of distilling history. The not-so-secret “secret” to their ultra smooth single malt whiskey is the triple distillation in their unique copper stills, which gives Bushmills its’ distinctive flavor. The tour begins with a look at inside one of the copper stills that has been essentially cut in half so that you can fully see just what it looks like. The 45-minute long tour then weaves through the various buildings, each with their own job in the distilling process. From where the water from the springs of the St. Columb’s Rill arrives to the malting of Irish barley, and then on to the how the various oak casks also lend their attributes to the aging whiskey, it’s all a build-up to finally getting to taste Bushmills Irish whiskey. The Bushmills tour ends with a tasting of their Irish whiskey. It’s unclear exactly how many whiskeys you get to taste on the tour, but our tour ended with a tasting of three. We tasted Bushmills Black Bush, which is aged in former Oloroso Sherry casks. Bushmills whiskey is aged for a minimum of five years and we also had a taste of the 10-year Bushmills Single Malt Whiskey which is aged for 10 years in bourbon season barrels. We were also offered to select a final drink from the bar, which included several of their whiskeys as well as an option for a hot toddy or the Bushmills cocktail of the day. Whiskey is a little harsh for me to drink straight up, and I selected the cocktail of the day while Tim went with one of the aged single malt whiskeys. The cocktail went down a little too easily. Bushmills offers the tours only a first come, first serve basis. Be sure to check their opening times to check the start time for the last tour of the day if you plan to visit in the afternoon. There’s also a a gift shop onsite that you can access without taking the Bushmills distillery tour and there’s a good cafeteria-style restaurant, one of Bushmills’ restaurants only open for lucnh. The restaurant offers home cooked Irish comfort foods like Irish stew with soda bread, and is a good option for a fast lunch of delicious food. Perched on the sheer basalt cliffs, Dunluce Castle is a now-ruined castle near Giant’s Causeway. It’s dramatically set and even if you don’t want to explore the grounds and ruined stone buildings that remain, it’s worth the stop for the photo ops. It’s also another of the Game of Thrones locations, serving as Castle Greyjoy. The castle is precariously set on an outcrop with steep drops surrounding it and connected to the mainland by a little wooden bridge. It’s said to have been built by the McQuillan family in 1513, who were Lords of the Route at the time. The family held the castle for 55 years, until they lost it to the MacDonnell family in the Battle of Orla in 1565. 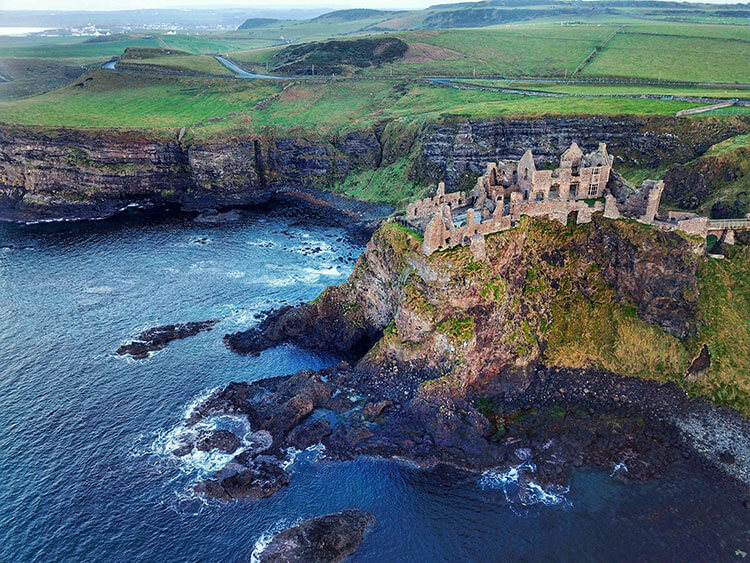 The MacDonnell family still owns Dunluce Castle to this day. There’s many legends and ghost stories associated with the cliff-top castle. One is that the ghost of Lord McQuillan’s daughter, Maeve Roe, haunts the north-eastern tower. Sometime during the 55 years that the McQuillan family owned the castle, Lord McQuillan imprisoned his only daughter in the tower after she refused to marry Rory Org. Maeve Roe was actually in love with a boy named Reginald O’Cahan, and one dark and story night he helped Maeve Roe to escape from the tower. They climbed down to the Mermaid’s Cave 25 meters below, where Reginald had stashed a row boat. He furiously rowed against the waves and storm, but they lost their lives after being tossed like rag dolls among the rocks. Another tale tells of the fateful day that the castle’s kitchen collapsed and slid right down the side of the cliffs and in to the sea. The collapse supposedly took everything with it, including seven cooks. But one boy who had been sitting in a chair in a corner was spared. It’s said this was the final straw for the owners, who then refused to live in the castle any longer. Though the tale can’t actually be true, as the kitchen remains among the ruins to this very day. What isn’t a tale is that the north wall of the residence building did actually collapse and fall in to the sea sometime in the 18th century. And the castle is only a small fraction of the lost town of Dunluce, which was an intricate network of streets and buildings built by the MacDonnell family in 1608. Excavations have been ongoing since 2011 and 95% of the town, considered to be the most revolutionary in Europe in the 17th century – buildings even had indoor toilets!, is yet to be uncovered. 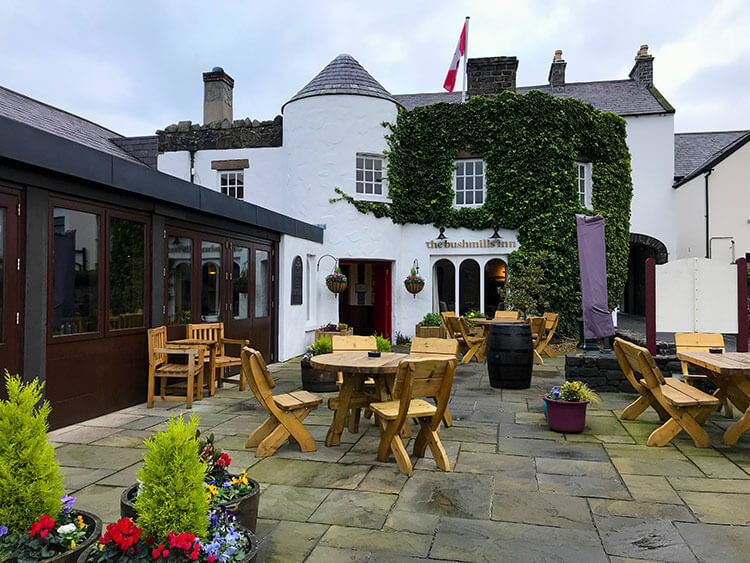 The Bushmills Inn is originally a coaching house from the 1600s and is in an enviable location just a stone’s throw from the Giant’s Causeway. The history, location and its renowned luxury were precisely why we chose to stay at the Bushmills Inn during our stay on the Causeway Coast. 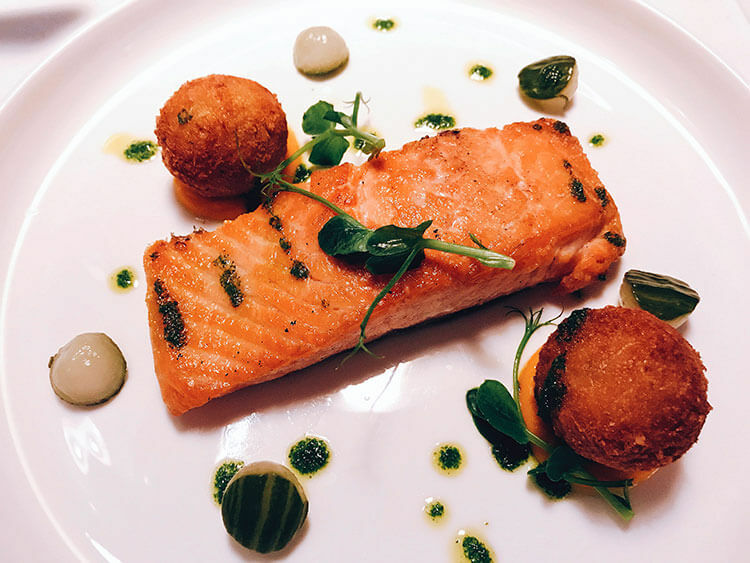 The Bushmills Inn is also known for its award-winning restaurant, which is committed to using the highest quality ingredients from local suppliers. The restaurant is set in the former stables and wine cellar, the oldest part of the coaching house. A peat fire burning at the entry is a warm welcome, and it’s an incredibly cozy setting. The food is a marriage of classical Irish dishes with new Irish cuisine, and always with a Bushmills twist. The menu changes seasonally to best local ingredients and the suppliers are proudly displayed in the menu. We started with Guinness and onion soup, Bushmills Inn’s take on French onion soup with Cahill Porter cheese. The whiskey cured salmon was the best piece of salmon I’ve ever had and I’m still dreaming of it. Between the soup, filling up on the delicious Irish soda bread and dinner, there just wasn’t any room left for dessert. But the platter of Irish cheeses was certainly tempting. While Bushmills is the star of the bar menu, we really loved the local Northern Irish gin flight available and local beers on tap. The gin flight gives you a chance to taste three different Northern Irish gins: Jawbox, Shortcross and The Boatyard. The flight comes with each gin garnished to highlight and bring out the individual botanicals each is crafted with, and a bottle of tonic. No matter what you decide to eat and drink at The Bushmills Inn, you won’t be disappoint. 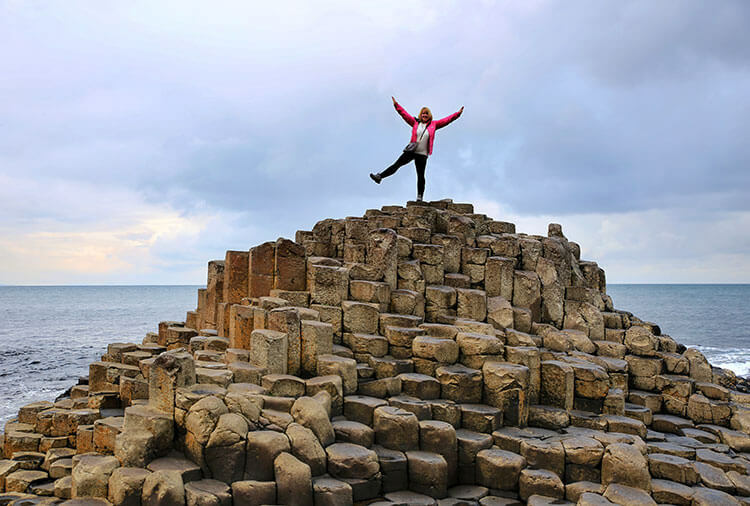 You could easily spend a week exploring the Causeway Coastal Route, which stretches for about 150 miles from Belfast up to Derry~Londonderry. This part of Northern Ireland is just so spectacularly beautiful that you want to linger a little. But if you only have three days, you’ll definitely want to devote an entire day to the Causeway Coast between Giant’s Causeway and Carrick-a-Rede. Days are much longer in the summer months, but even in the winter take time to explore at least of bit of the Causeway Coastal walk. The scenery seems to change around each and every bend and each bay is unique. 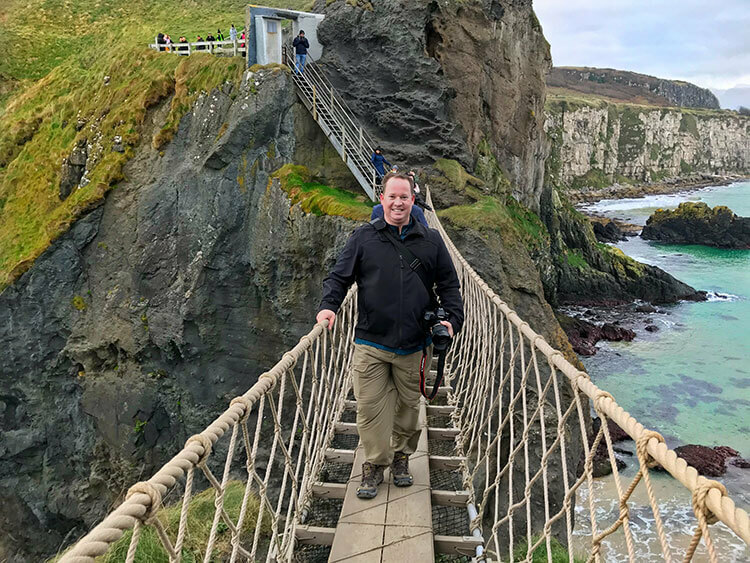 The section from Giant’s Causeway to the Carrick-a-Rede rope bridge is only a mere nine miles, but nine miles that packs a punch in scenic beauty. We’ve already established that the Causeway Coast is a place that loves a good legend. Of course, there’s a legend about how the Giant’s Causeway came to be. The Giant’s Causeway legend tells the tale of an Irish giant named Finn MacCool, who was the leader of a band of warriors called the Fianna in Irish myths that date back as far the third century AD. Finn MacCool wanted to go to battle with a rival Scottish giant named Benandonner. So Finn MacCool built an enormous path of stepping stones across the sea stretching from Ireland to Scotland so that Benandonner could cross. When Finn MacCool sees Benandonner coming, he’s intimidated by the Scottish giant’s enormity and flees home in fear. Finn MacCool asks his wife to hide him, and Oonagh do so by disguising Finn MacCool as a baby. She even places him in a huge cradle. Benandonner equally fears Finn MacCool when he sees the gigantic baby. He too flees home in terror, ripping up the Causeway so that the Irish giant cannot follow him. The surviving end of the Giant’s Causeway, named for the legend of Finn MacCool, lies at Fingal’s Cave on the Scottish island named Staffa to the north. If you take an audio guide from the Giant’s Causeway Visitor Center, it will humorously regale you with the legend as you explore. Without the audio guide, we would have missed the significance of the some of the rocks like the large boot shaped one down the beach that is supposedly one of Finn MacCool’s boots that he tossed aside so that he could run away faster when he saw Benandonner approaching. Aside from the fun folklore, the audio guide provides interesting Giant’s Causeway facts and is included with the Giant’s Causeway Visitor Center admission ticket. So what is the Giant’s Causeway then? Fun as the Giant’s Causeway story is, in reality it was around 60 million years ago that the tectonic plates of the earth began to move apart. The movement forced molten lava up through the fissures, and flowed out in to a river valley. The lava flow cooled and cracked slowly and evenly, much like mud does when it bakes in the sun, creating the basalt columns of the Giant’s Causeway. Most of the columns have five or six sides. But if you look closely, you’ll find columns with four or even eight sides. Supposedly there is just one of the columns that has three sides. Another legend? You’re challenged to do a bit of hunting to see. This landscape we see today would have looked much different 60 million years ago, and it was only about 15,000 years ago that the shoreline here was actually exposed when the last ice sheet melted. The thick layers of the ice age ground down the basalt columns, leaving behind the the boulders that almost seem to fit together as perfectly as puzzle pieces. Most of the tour buses that make their stop at the Giant’s Causeway make a beeline for the the Middle Cause, or what’s known as the Honeycomb. This is just one of three promontories and has the very precise hexagons that everyone loves to be photographed posing on. 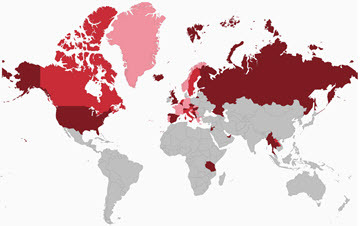 And this is precisely why we think it’s best to visit independently. You’ll have time that the tours just don’t allow for to explore the other formations that all play a part in the much longer Giant’s Causeway myth. It takes a little more scrambling along the boulders to get all the way out on the Grand Causeway, but this is the part stretching out in to the sea towards Scotland. It does look exactly like a paved roadway fit for giants. And if you keep watch out to the sea, you might just get as lucky as we did to see massive schools of dolphins jumping and playing in the bay. Beyond the Grand Causeway is where you find the Giant’s Boot. 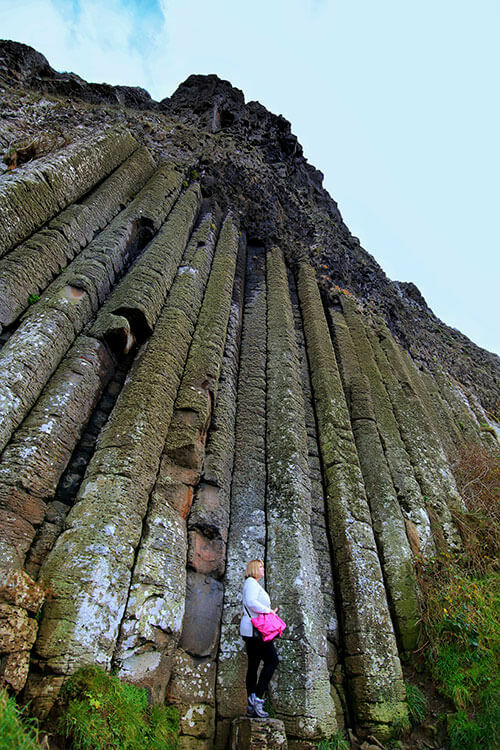 And if you hike along the Giant’s Causeway coastal route for a bit, you’ll pass the Organ. The soaring columns that seem to stop abruptly are said to have been built by Finn MacCool for his son to play music on. Supposedly you can hear the music, but only if you visit at exactly 11am on Christmas Day. The Chimney Tops, which look a bit like the formations of Monument Valley to us, are some remaining basalt columns that were entirely isolated when the cliff eroded. They’re named because another tales says the Spanish Armada ship, which wrecked below the cliff in 1588, mistook the columns for the turrets of an enemy castle and fired at them. 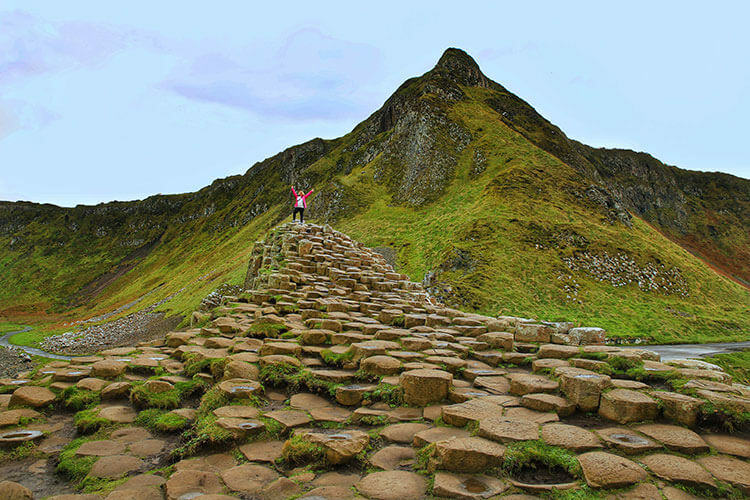 There are four marked hiking trails at the Giant’s Causeway and it’s well worth completing the panoramic Red Trail, which links up with the Blue Trail for a 3 kilometer loop. At the very least, take the cliff top trail down to the Giant’s Causeway from the Visitor Center for incredible views over the entire bay. 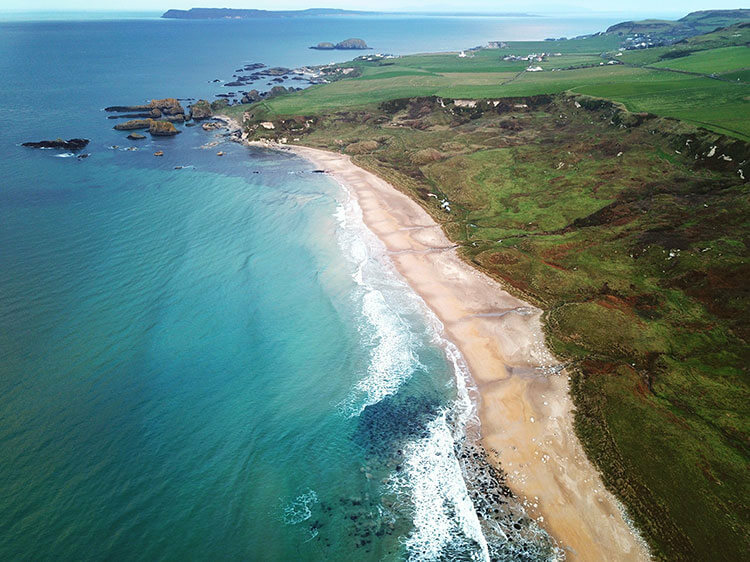 Perhaps most surprising about Northern Ireland and the Giant’s Causeway Coastal Route are the miles of white sand beaches that are fringed with water so blue you’d almost think it’s the Caribbean. Almost – if it weren’t for the wind, misty rain and cold temperatures to remind you that you’re really in Northern Ireland. White Park Bay is one of those stunning beaches. It’s a 3-mile long stretch of white sand set in a bay. Sheep and cows love to graze on both the hillside leading down to the beach and the beach itself. Geology lovers will definitely want to add White Park Bay to your Causeway Coastal Route itinerary. The cliffs are made of chalk here and formed during the late Cretaceous period when much of the continents, including Ireland, were under water. A lot of fossils can be found here and if you visit in the summer, you can even join free geology walks in the bay. The Giant’s Causeway Coastal Route isn’t just about the stunning natural beauty, which there is definitely plenty of. Northern Ireland is also known as a foodie destination thanks to its sweet grasslands and clear waters, producing outstanding fish, seafood, meat and dairy. Northern Ireland was even awarded the title as the world’s best food destination of 2018 in the International Travel & Tourism Awards at WTM. There’s no shortage of small pubs and eateries committed to serving only locally sourced products. We selected the Fullerton Arms, the only moulerie in Northern Ireland. They serve fresh Strangford rope mussels, as well as locally sourced products. The hardest decision is which of the sauces to have your mussels in. 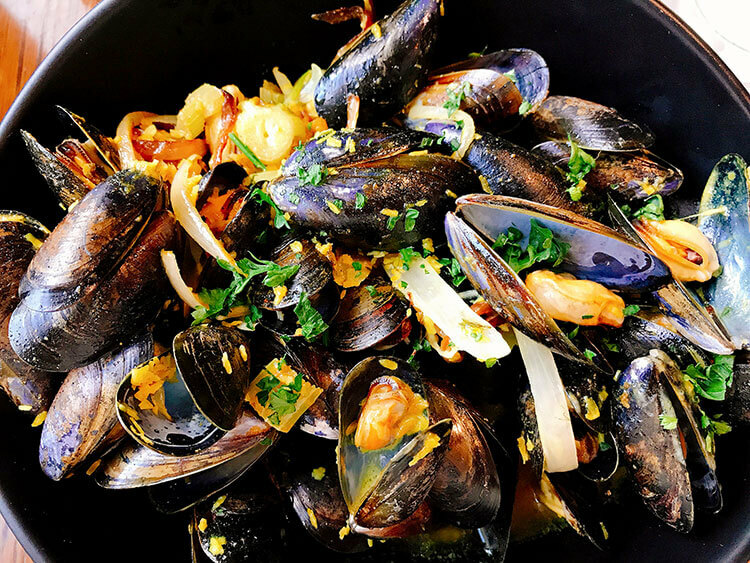 The choices are handwritten on a chalkboard daily to pair the best seasonal ingredients with the mussels. I chose the Jawbox gin (a local Northern Irish gin made in Belfast), ginger and coconut broth which was like a mild curry. The mussels are also served with fries and some of the most delicious mussels I’ve had anywhere. 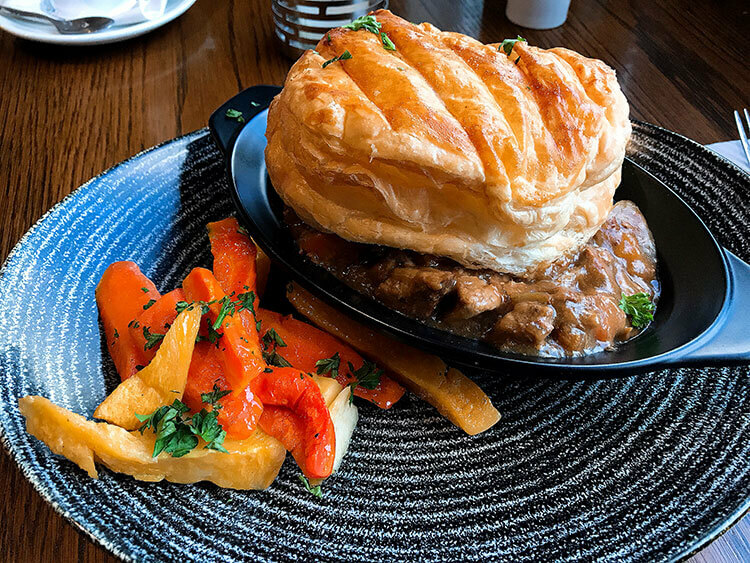 Tim opted for the beef and Guinness pie made with slow cooked local Irish beef. Everything came with Irish wheaten bread, which is homemade by Fullerton Arms’ in-house baker. Game of Thrones fans will also love the Fullerton Arms. When Storm Gertrude swept through and brought down some of the trees from the Kingsroad (The Dark Hedges), the beech wood from those fallen trees was used to carve out a series of 10 intricate doors that each tell the story from an episode of Game of Thrones Season 6. 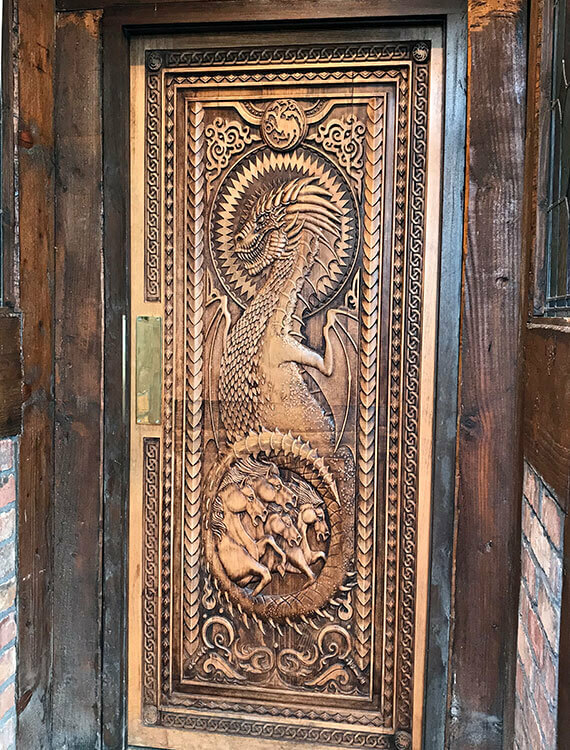 The Fullerton Arms proudly displays Door #6 on the Game of Thrones Journey of Doors. 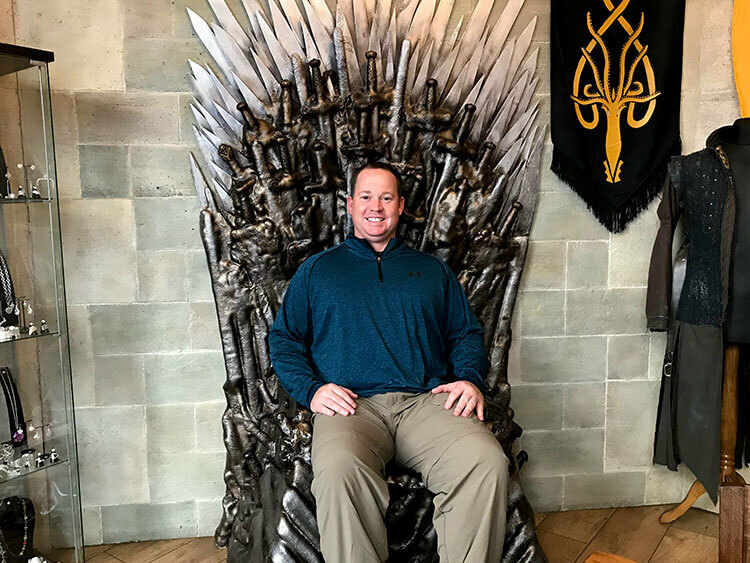 They also have an entire room, which you can reserve to dine privately in, that is dedicated to Game of Thrones memorabilia. We imagine its a haven for fans and a unique spot to enjoy a meal. The Causeway Coast has a long history of Atlantic salmon fishing with fishing the main industry in the villages like Portrush, Ballycastle and Portstewart for centuries. But it wasn’t until 1755 when salmon fisherman erected the first rope bridge at Carrick-a-Rede that the spawning salmon were accessible. A little island sat just 20 meters (65 feet) off the mainland. The Atlantic waters that separate the island from the mainland were a route for the spawning salmon returning to the Bush and Bann rivers year after year. It doesn’t sound or look like a great distance, but reaching the little island was dangerous in the rough waters between the two. Salmon fisherman built a rope bridge spanning the 20 meter chasm between the mainland and the little island. It was a solution that made them less reliant on boats and finally able to fish the salmon from this spot. 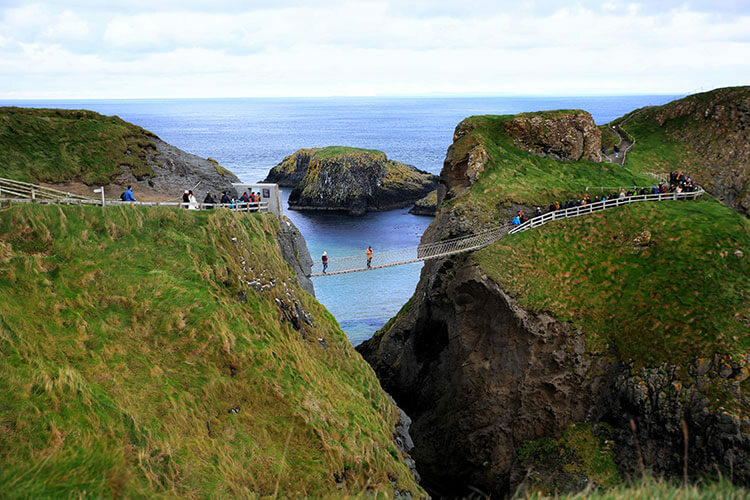 It’s thought that the island itself, named Carrick-a-Rede Island, was named around the same time that the first bridge was built. The name meant “the rock in the road” since the island was quite literally a giant rock in the salmon’s roadway to the rivers. Fishing took place from the lone whitewashed fisherman’s cabin built on the island. Nets would be cast over the chasm. The bridge itself is said to have been very dangerous – it had just a single handrail and was made of widely spaced wooden slats. It was rebuilt every spring and dismantled come the end of the salmon season in the fall for centuries. Salmon fishing at Carrick-a-Rede continued right up until 2002, when the very last salmon was caught in October that year. Fishing was stopped at Carrick-a-Rede both because of the decline of Atlantic salmon from over-fishing out in the ocean and river pollution. The National Trust had bought the island back in the 1970s and decided to open it up to tourists. The bridge we still see today was built and opened to the public in 2008. 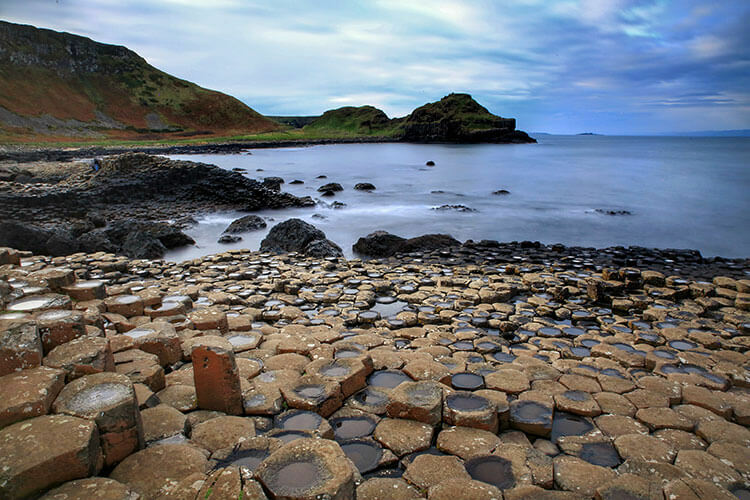 It’s located just nine miles down the coast from Giant’s Causeway. The rope bridge sits 98 feet above the Atlantic. When it’s windy, which it’s pretty much guaranteed to be since it is Northern Ireland, after all, the bridge sways with the wind. Though no injuries or accidents have ever been recorded at Carrick-a-Rede rope bridge, it’s often listed among the world’s scariest bridges. Just crossing the swaying bridge 98 feet above the water is a thrill for many. Some tourists have been so paralyzed by fear of returning back across the bridge that they’ve had to be taken off the island by boat. Carrick-a-Rede was easily the busiest spot we visited along the Causeway Coast and it was off-season at the end of November. Carrick-a-Rede has become one of the top tourist attractions on the Causeway Coast and it’s good to know that the ticket is a timed entry. The entry is for a 1-hour time slot, meaning you have to present your ticket at the bridge within the 1-hour time frame listed on your ticket. There’s no limit to how much time you spend on the island. It’s a 1 kilometer walk along a coastal path from the parking area to the bridge. It’s best to plan to visit at opening, especially if you’re visiting in the summer. Book your ticket online in advance to ensure you’ll be able to visit. It’s also good to know that the bridge itself can be closed for weather or that parts of the island may be closed for visitor safety. Belfast was essentially flatted in the Belfast Blitz. One of 16 cities in the UK to suffer the German air raids of WWII, Belfast was ill-prepared and never believed the bombers could reach the city. Left with wide-spread devastation, the city, its shipyard and its industry were destroyed. Then there was that period from the 1960s until 1998; a period known as The Troubles when car bombings, rioting and looting were the daily norm. Belfast is a city that has lived a thousand lifetimes. We think it’s important to keep that all in mind and set expectations appropriately. Today, Belfast is a mix of mostly modern laced with the occasional historic building that managed to survive. It wasn’t our favorite of cities, but Belfast is still worth spending some time in. If you only have a half day before you head back to the airport, we think St. George’s Market and the Titanic Museum Belfast are the sights you shouldn’t miss. Start the day at the oldest continually operating covered market on the island of Ireland. 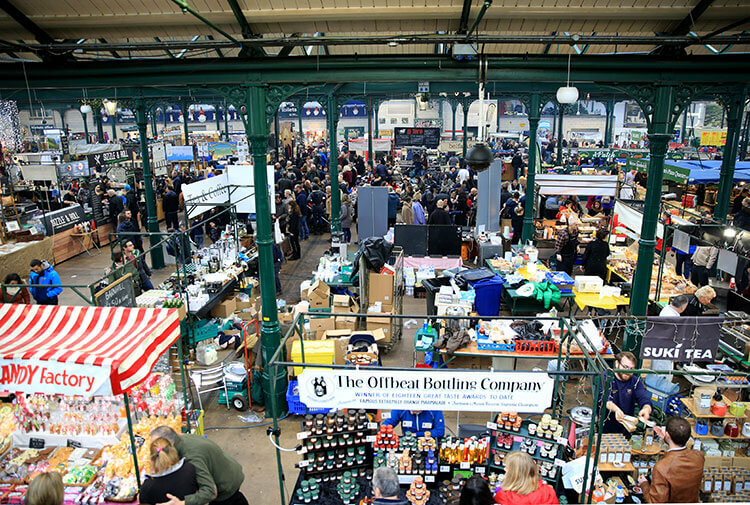 No matter which of the three weekend days you choose to explore St. George’s Market, there are nearly 250 stalls to browse. There’s been a market at St. George’s since 1604. Though the Victorian building we actually see today was built from 1890 – 1896, St. George’s Market shouldn’t be missed. It’s open on Friday, Saturday and Sunday and the market changes each day. The Friday Variety Market is largely dedicated to fresh produce, meat and fish (there’s 23 stalls selling fish alone and is reputed to be the best fish market in all of Ireland) along with secondhand books, antiques and clothing. 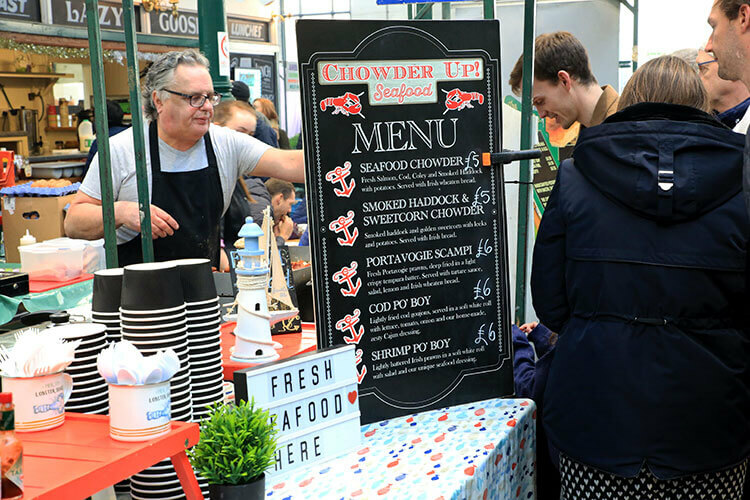 The Saturday City Food and Garden Market turns into a food fair from around the world with everything from local Irish breakfast baps and soda bread to smoothies and Cubans (the sandwich, not the cigar). There’s vendors selling spices, chilis, cheeses and chocolates. There’s also artists selling photography, crafts, jewelry and plants. Sunday’s market is a combination of both the Friday and Saturday markets with a large focus on local arts and crafts people, giving them a place to sell their wares. Once upon a time, Belfast had the largest shipyard in the world and its shipbuilding industry made it famous. The Titanic, and its sister ships the Olympic and Britannic, were the largest ocean liners in the world at the time that they were built at the Harland and Wolff shipyard in Belfast. Since the day the ship launched, a day that its said the entire city partied after the massive feat launching the world’s largest ocean liner was, Belfast and the Titanic have been synonymous. Opened in 2012, the Titanic Belfast is an interactive visitor experience that aims to tell the intertwined story of Belfast and the ill-fated ship. While we all know the story of Titanic and her sinking on April 15, 1912 thanks in large part to Hollywood, Titanic is a ship has long riveted the world. With other Titanic museums and a decade of analyzing the ship and that fateful night, what more of the story could possibly be left to tell? A lot, actually. The experience starts with Belfast’s commercial life when linen, not shipbuilding, dominated the industry in the city. Known as Linenopolis, Belfast was the greatest linen producer in the world and the demand for exporting it is what catapulted Belfast into developing its port. Harland and Wolff launched their shipyard in 1858, and quickly became Belfast’s leading shipyard. By 1899 Harland and Wolff had already built the world’s largest ship afloat, the Oceanic II. The museum is also about celebrating those achievements. As you move from room-to-room in the museum, you’re introduced to the Harland and Wolff team who dreamt up the world’s most luxurious ship. The pride to take on the project of building Titanic is evident in the detailed exhibition about the technical design of the ship. But it’s never too much and not interesting; Titanic Museum Belfast delivers just the right amount of information in ways that are easy to digest, including a short ride that immerses you in to the shipyard while Titanic is being built. While there are no actual surviving objects from Titanic on display, there are recreations of a lifeboat and of first, second and third class cabins. And as you wander in to another room where multimedia displays show video clips of the launch day, a floor to ceiling wall of glass looks over the very spot where Titanic was built and launched from on May 31, 1911. There’s a lot of respect given and care taken to honor those who died that infamous night. Voices of survivors play as they recount that night. An exhibition remembers those that died, and continues on to address the actions taken by the White Star Line after the disaster. The exhibition ends with a short movie taking you 12,500 feet below the surface to where the Titanic rests on the ocean floor. The video taken with a submersible used to study the wreck shows the debris field and objects that are unimaginably intact more than a century later. Even the building itself is designed to tower at the exact height that Titanic stood, giving you the perspective of just how large the ship was. From the right angles, the four corners represent Titanic’s bow. And taking in the entire building, it could resemble the iceberg that brought Titanic down. Plan for around 1.5 – 2 hours to visit the Titanic Museum Belfast. The ticket also includes a visit to SS Nomadic, the former tender of the White Star Line designed to transfer passengers and mail on to the Titanic. SS Nomadic is the only White Star Line ship still in existence today and is dry docked just across from the Titanic Museum. 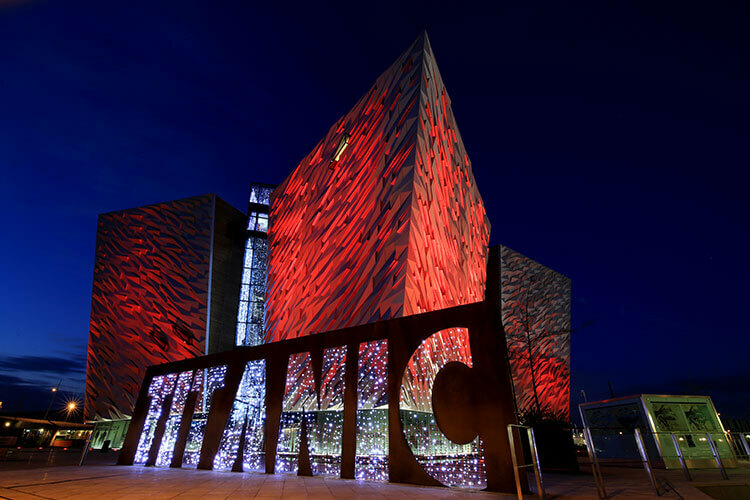 Purchase your Titanic Museum Belfast ticket online in advance to avoid the queues. The Bushmills Inn is one of the most historic hotels near Giant’s Causeway. A coaching inn from the 1600s, it’s long been a favorite stopover of travelers on the way to the Giant’s Causeway. They’d stop to sample the whiskey of the Old Bushmills Distillery, which made the village famous. It was a coaching inn until the 1890s, when it quickly fell into disrepair after the tram link to the Causeway came in to use. A century later, The Bushmills Inn was refurbished into a luxury boutique hotel and today is has 41 rooms and an award-winning restaurant. The fire’s always lit and the staff are warm and welcoming. 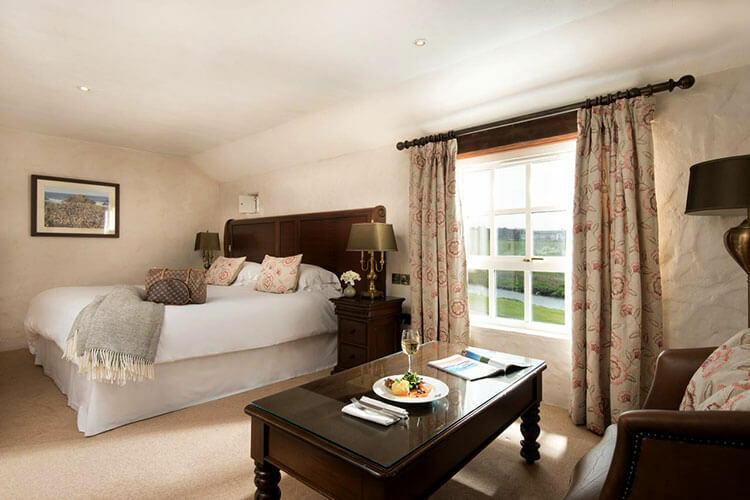 The guestrooms are housed in the 18th century part of the The Bushmills Inn. The rooms are spacious and offer all the modern amenities, but the decor is thoughtful and reminiscent of the time when the hotel was a coaching inn. The mini bars are stocked with complimentary water and there’s a tea kettle and coffee machine. All rooms but the Mill House Classic have separate showers and bathtubs. Superior rooms and suites also have a view over the River Bush, which runs alongside the hotel. Breakfast in the Bushmills Inn Restaurant is superb. There’s a small buffet of fruit, yogurt, cheese, bread, pastries and juice. Hot dishes are selected from the menu and we tried both the eggs benedict and scrambled eggs with smoked salmon. The Bushmills Inn also has its very own boutique cinema and Thursdays are movie night at the hotel. The movies change from week to week, so check their website to see what’s playing and book your tickets. The ticket includes a 2-course dinner before the movie and popcorn for during the movie. There’s complimentary on-site parking and the Bushmills Inn is an excellent choice for accommodation near Giant’s Causeway. While the public bus service and Giant’s Causeway Park & Ride are seasonal, if you’re visiting from March through October you can either leave your car at the hotel and use the public bus service or utilize the Park & Ride. Buses operate frequently and reach Giant’s Causeway in just 5 minutes from Bushmills. The Causeway Coastal Route runs from Belfast to Derry. Arrive at Belfast International Airport for a trip exploring the Causeway Coast. It’s best to rent a car to explore independently. The Giant’s Causeway Visitor Center is run by the National Trust. Your admission ticket includes an audio guide. The shuttle bus down to Giant’s Causeway from the Visitor Center is operated by TransLink and is an additional fee, but we recommend taking the cliff top path anyway. Book your Giant’s Causeway tickets in advance and get a discount on each ticket, as well as avoid the queue. There are several options for Giant’s Causeway parking. The most popular way to access the Giant’s Causeway is through the Giant’s Causeway Visitor Center. There is a fee to park on-site and in peak season the car park fills up quickly. You can also utilize the public buses or the Giant’s Causeway Park & Ride in Bushmills. Carrick-a-Rede rope bridge is only accessible by a timed entry ticket. Book your tickets in advance to ensure your entry, as well as avoid the queue.